Acquired from the artist by 1828 by Charles Robert Leslie, London; sold c. September 1839 to Sherman Converse. (Coates and Company, New York), in 1847. Joseph Ripley, in 1858. purchased by Daniel Huntington, by 1873; purchased from his estate 17 June 1911 by the Corcoran Gallery of Art; acquired 2014 by the National Gallery of Art. Albany, New York; Hartford, Connecticut; Middletown, Connecticut, Fall 1823. David Doggett's Repository, Boston, February-April 1823. Essex Coffee House, Salem, Massachusetts, May 1823. 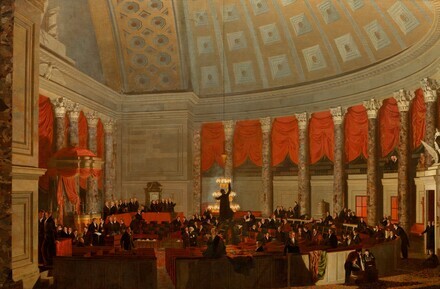 Morse's Popular Picture of the Hall of the House of Representatives, 146 Fulton Street near Broadway, New York, May-July 1823. New Haven, Connecticut, early February 1823. Possibly Springfield and Northampton, Massachusetts, 1823. American Academy of Fine Arts, New York, 1825, no. 4, as Hall of the House of Representatives, Washington City, preparing for an evening session. Annual Exhibition, National Academy of Design, New York, 1827, no. 51, as House of Representatives in the capitol at Washington, containing 88 portraits of distinguished characters. Peale's Gallery of the Fine Arts, Albany, 1828, no. 23, as The Celebrated Picture of the House of Representatives. Second Winter Exhibition, National Academy of Design, New York, 1868-1869, no. 178, as The House of Representatives in Washington, in 1823. Samuel F.B. Morse: American Painter, The Metropolitan Museum of Art, New York, 1932, unnumbered catalogue. Life in America: A Special Loan Exhibition of Paintings Held During the Period of the New York World's Fair, The Metropolitan Museum of Art, New York, 1939, no. 72. American Processional, 1492-1900, Corcoran Gallery of Art, Washington, 1950, no. 116. American Painters of the South, Corcoran Gallery of Art, Washington, 1960, no. 82, cover repro. Loan to display with permanent collection, National Portrait Gallery, Washington, 1970-1971. Nineteenth-Century America: Paintings and Sculpture, The Metropolitan Museum of Art, New York, 1970, no. 28. La Pintura de los Estados Unidos de Museos de la Ciudad de Washington [Painting in the United States from Public Collections in Washington], Instituto Nacional de Bellas Artes, Mexico City, 1980-1981, no. 7. Figuratively Speaking: The Human Form in American Art, 1770-1950, Corcoran Gallery of Art, Washington, unpublished checklist. Encouraging American Genius: Master Paintings from the Corcoran Gallery of Art, Corcoran Gallery of Art, Washington; Museum of Fine Arts, Houston; Parrish Art Museum, Southampton; Mint Museum of Art, Charlotte; John and Mable Ringling Museum of Art, Sarasota, 2005-2007, checklist no. 13. Corcoran Gallery of Art. Handbook of the American Paintings in the Collection of the Corcoran Gallery of Art. Washington, 1947: 26, as The Old House of Representatives. Corcoran Gallery of Art. Masterpieces of the Corcoran Gallery of Art. Washington, 1959: 47, repro. Gerdts, William et al. Lasting Impressions: American Painters in France 1865-1915. Exh. cat. Musée Américain Giverny, 1992: 126-127, fig. 115. Staiti, Paul. "Samuel Finley Breese Morse, The House of Representatives." In Corcoran Gallery of Art: American Paintings to 1945. Edited by Sarah Cash. Washington, 2011: 36, 70-73, 257, repro. Raab, Jennifer. "Mapping History." American Art 29, no. 2 (Summer 2015): 19-27, color figs. 1, 3 (detail).